Ahead of the Berlin trade show, we got hands-on time with Sony's third-generation WH-1000XM3 cans, and the party vibes of the XB01 and XB501G weatherproof loudspeakers. 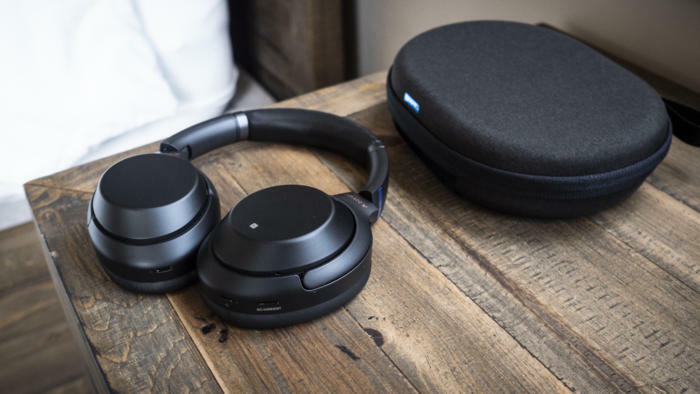 Sony’s mobile audio group is showcasing two new products at IFA 2018 in Berlin: The third generation of its wireless noise-cancelling headphones—the WH-1000XM3—and a couple of weatherproof, wireless, outdoor smart speakers: the Extra Bass XB01 and the much larger Extra Bass XB501G. Sony invited me to a hands-on demo San Francisco the week before the show got underway. 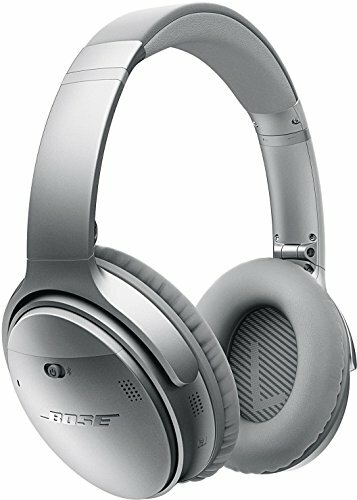 The new Bluetooth cans are Sony’s latest to go against the market leader in this category, the Bose QuietComfort 35. 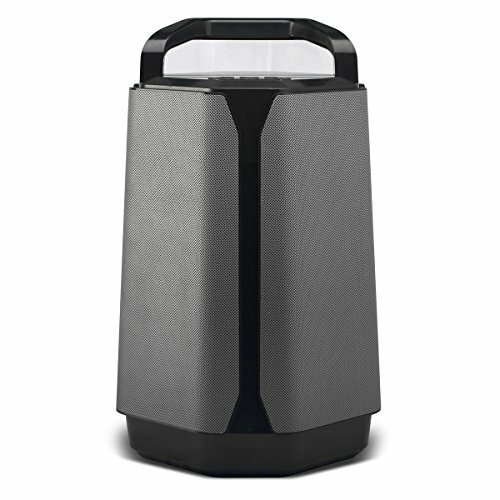 It’s more difficult to identify a competitor for the new outdoor speakers—at least the larger of the two. Lots of companies are in this space—ranging from Bose to Soundcast—but few are building outdoor smart speakers. The XB01 is a Bluetooth “dumb” speaker, but the much bigger XB501G has both Bluetooth and Wi-Fi radios onboard, as well as Google Assistant. Sony had the headphones and the larger speaker on hand for the demo. Here are my thoughts so far. Sony’s Extra Bass XB501G outdoor smart speaker (featuring Google Assistant) can be mounted on a tripod. 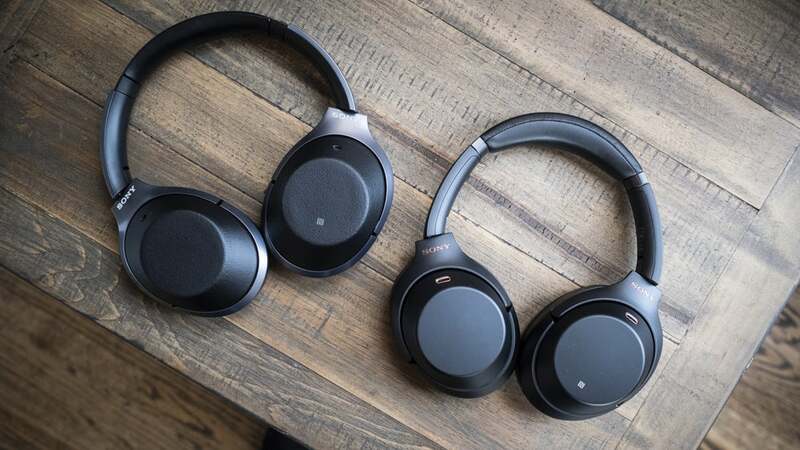 Sony’s WH-1000XM3 features considerable upgrades compared to its previous two generations of wireless noise-cancelling headphones. It’s set to come out this September for an MSRP of $349, the same price as the highly rated WH-1000XM2 it will replace. There’s an all-new custom chip onboard—the HD Noise Cancelling Processor QN1—which Sony said will deliver “approximately 4x greater performance than the previous processor.” The new chip promises to cancel background noises such as voices and street traffic as well as the drone of things like air conditioners and jet engines. Having used a review unit around the Bay Area for a couple of days, I can hear the improvements, but will reserve final judgement for my upcoming review. The next improvement is the ability to gain five hours of battery life after only a 10-minute charge, thanks to the upgraded Quick Charge function over its USB-C port. This is a convenient feature if you need a quick top-off before hopping on a cross-country flight. Sony otherwise says the new phones will deliver the same 30-hour battery life as the second-generation model, even though the new QN1 chip is more powerful than the last. Sony’s third-generation noise-cancelling headphones—the WH-1000XM3—promise to be even more comfortable to wear. Not all of the WH-1000XM3 improvements are inside the case. While there was little to no difference in the outward design between Sony’s first and second-generation noise-cancelling headphones, the third-generation gets a big bump that makes them even more comfortable to wear. I immediately noticed the wider and deeper ear cups, and Sony has added more padding to the top of the headband, which now fits closer to the sides of your head. I’ll know more by the time I write my review, but I found them to be very comfortable during the demo. The two new speakers in Sony’s Extra Bass line are designed for powerful sound on the go. The pocket-sized XB01 has an IPX5 rating, which means it’s not rated for dust incursion, but it can withstand minor sprays and spills. The much beefier XB501G is rated IP65, meaning it’s dust tight and protected from water sprays from any direction. So neither speaker will survive a dunk in the pool, but both should be just fine around water. I didn’t get a chance to check out the smaller XB01, but it’s set to launch with four colors (red, white, blue, and black) this October at an MSRP of $34.99. 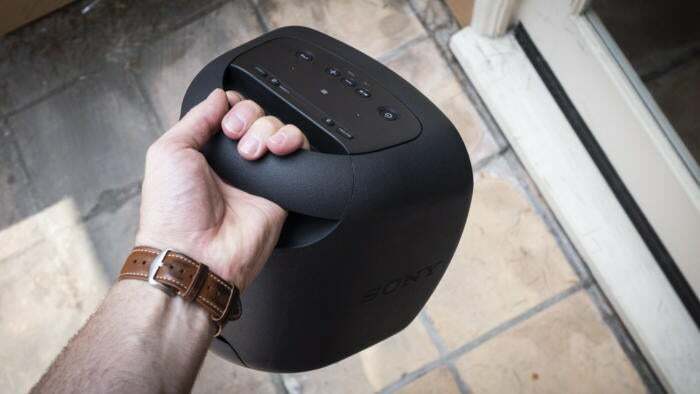 The oversized handle molded into the top of Sony’s XB501G’s enclosure makes the speaker easy to lug around. Sony did bring the party-ready XB501G to the demo. It will also launch in October and sell for $299. This model supports Wi-Fi in addition to Bluetooth, but Google Assistant integration is perhaps its most interesting feature. It can connect directly to streaming services such as Spotify, and you can use voice commands to request your favorite tunes, control smart home devices, and lots more. I was able to get the assistant’s attention with a “Hey Google” even when the speaker was playing at higher volumes. Wisely, Sony equipped the speaker with a mic-mute button if partygoers start abusing the feature. The company says this speaker will deliver a whopping 16 hours of battery life, and it boasts a USB-C port for charging your smartphone. It has an easy-to-grab handle on top, and a standard tripod mount on the bottom so you can elevate it to ear height for a better listening experience. 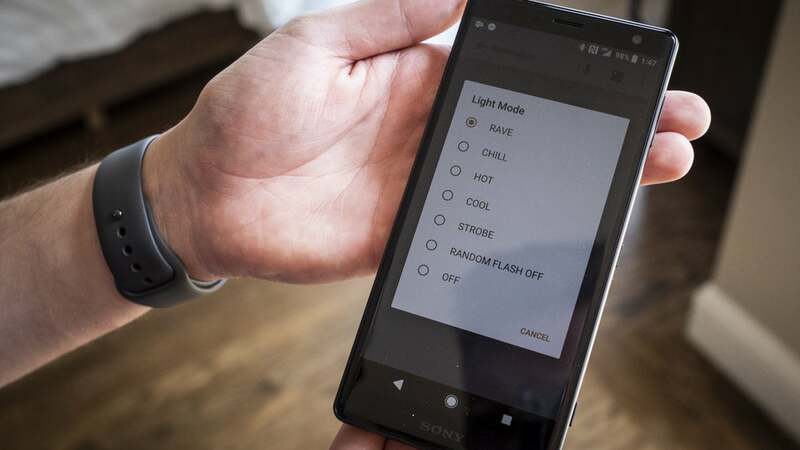 A smartphone app duplicates all of the XB501G’s control functions and lets you customize its onboard lighting. The XB501G features a pair of tweeters mounted above a large woofer in a curved-face enclosure to enhance its sound projection. You can customize the RGB lighting around its outer rim or just turn it off if you find it too garish. A second LED bathes the woofer cone in light, providing a mesmerizing glow as the speaker vibrates. 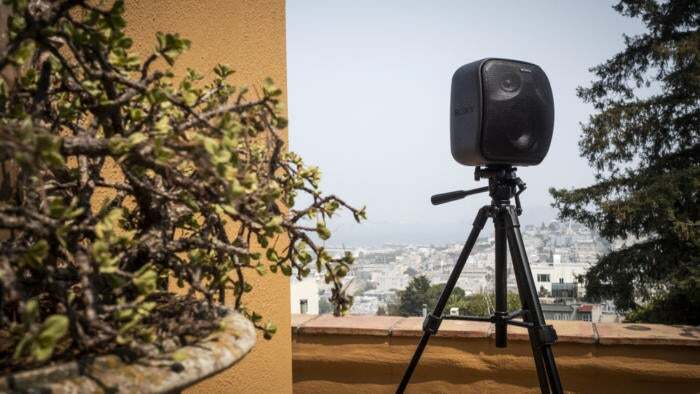 I listened to the speaker in two spots inside a large San Francisco apartment: in a bedroom on a built-in bookshelf, and then mounted to a tripod on the apartment’s balcony. My early impressions were quite positive, but I’ll perform more in-depth listening tests—in my own environments and with my own music—when I get an official review unit, so that I can really pick apart the nuances.